I can't even imagine hearing those words. 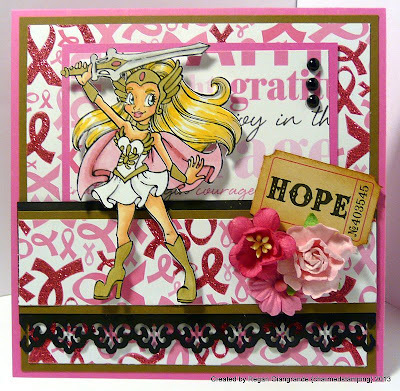 So when my aunt asked me to make her a special card for someone she knew who had recently been diagnosed with breast cancer I obliged. 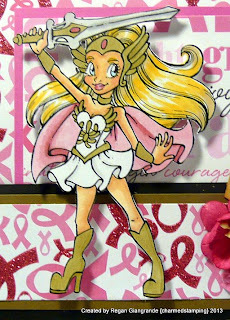 She wanted a warrior princess and I thought She-Ra, a generous freebie from Mayzy Art, was perfect. I colored her with Copics and fussy cut her. Papers are Me & My Big Ideas. 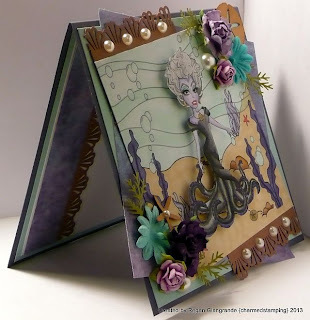 The current sketch from Sunday Sketch and Stamp served as my starting point, and I embellished with a border punch, flowers, flat back pearls, and a Tim Holtz adage ticket. 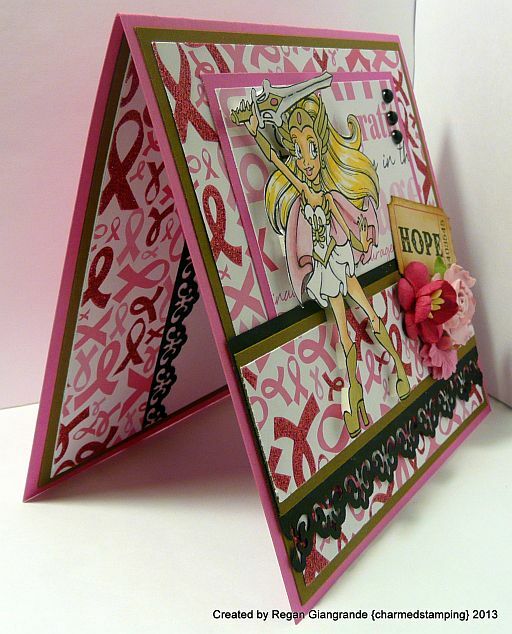 It makes me sad to make pretty cards for such an ugly disease, but I know the recipient will appreciate my aunt's thoughtfulness and support! Be sure to check out Mayzy's amazing blog and shop! You can find She-Ra and other freebies HERE and her new shop HERE! Thanks for visiting! I hope you are all having a wonderful week so far! Markers used: Copics (E11, E21, E00, R20, R81, R85, Y28, B00, N0, N2, Y32, Y35, E31). 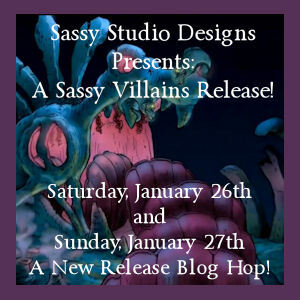 Welcome to the Sassy Studio Designs January release! Lindsay has Sassified four of our favorite villains, and we're here to show them off! 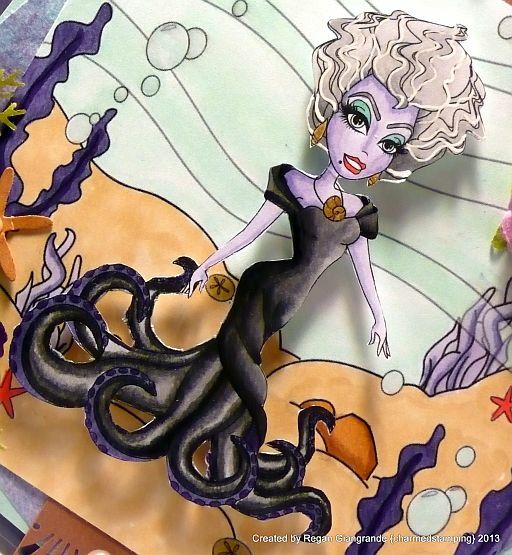 Whether you love them or love to hate them, you'll no doubt be enchanted by these wicked women! Our theme is....Going Forward....Looking Back! And we each chose a favorite project that we made during 2012. If you arrived here from Susan's blog, you are on the right track. If not, pop over to the SSD blog for the complete hop order. Trust me, you won't want to miss a single sinister creation! Or a chance to win! That's right, there are prizes! It just wouldn't be a Sassy hop without them! -1 randomly selected winner each day of the hop to win all 4 images. The winners of the teasers will be posted on tomorrows hop! And the winners of the hop will be posted on Wednesday the 30th. 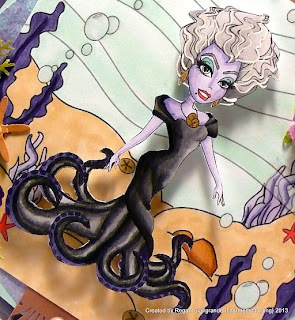 My image is Ursula Pinup! I just love her! She is colored with Copics and fussy cut. Anyone who follows my blog knows these are both favorite techniques of mine! 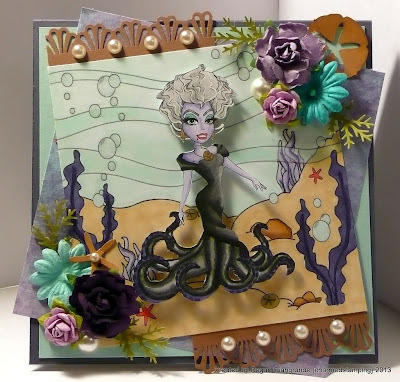 I used a retired background image (Under the Sea), also colored with Copics, that was a freebie over on our Paper Craft Planet group a couple of months ago. Then I did what I do best: EMBELLISHED! I added a punched border, sand dollar, and star fish- all from Martha Stewart; flowers; and pearls. 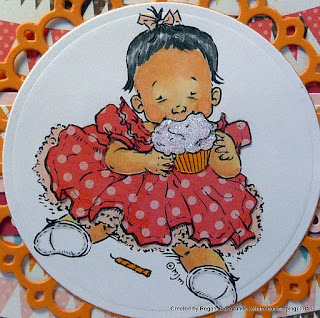 Not to mention the glaze pen on the bubbles; the white gel pen in her hair; and the metallic gold pen on her necklace and earrings! I usually utilize a sketch too (another fave technique of mine) but this time I went rogue and did it all on my own! Plus she's purple! My favorite color! Two of the cards are center step cards I made. These were just sheer genius, if I do say so myself, and I couldn't be prouder of them! The other card is a Halloween birthday card I created, and I love how all the elements come together! What are YOUR favorites? And what are you looking forward to in 2013? I have a lot to look forward to this year! I get to enjoy that small man of mine and cherish every moment of mommyhood! My best friend and I both turn 40 and we have some amazing shenanigans in the works! Plus my youngest brother is getting married in May, and he and his fiancee have asked me to officiate their wedding! 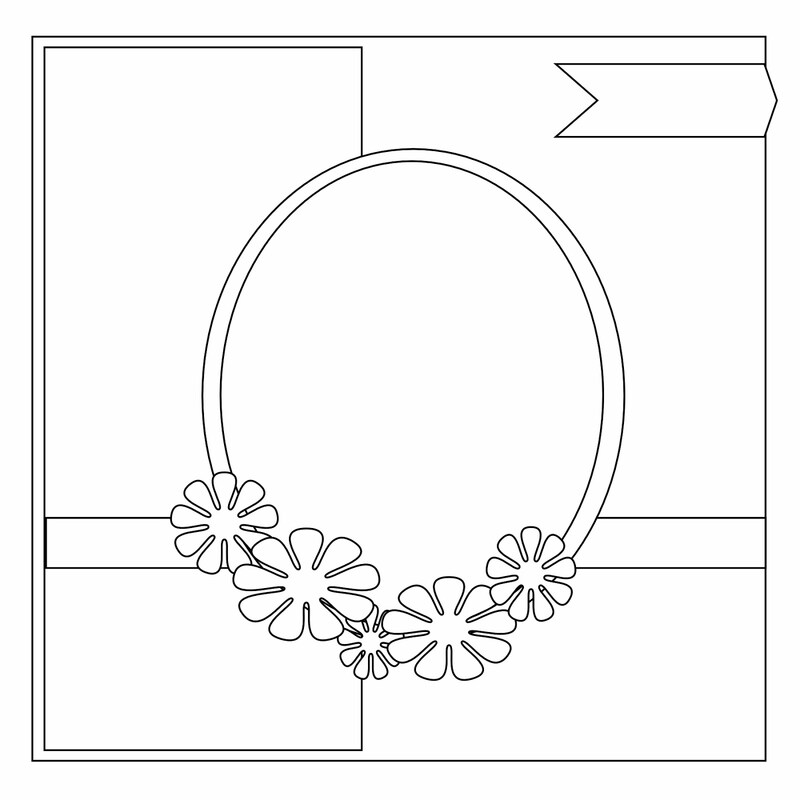 And then there's all the fabulous crafty projects that are just waiting to be made! So there are some exciting things happening here this year! 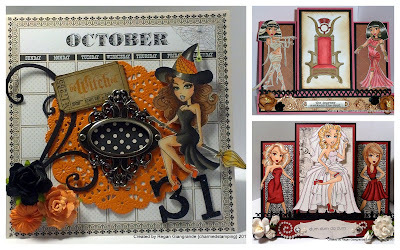 Your last stop on the hop is the Sassy Studio Designs blog. Be sure you're leaving love as you go to be eligible to win! I hope you are enjoying our release and your weekend! Thank you for stopping by! Markers used: Copics (BV000, BV02, BV04, BV08, BV17, BG10, BG13, R35, N0, N2, N4, N6, N8, 100, Y28, E23, E31, E34). It's Friday and we all know what that means! 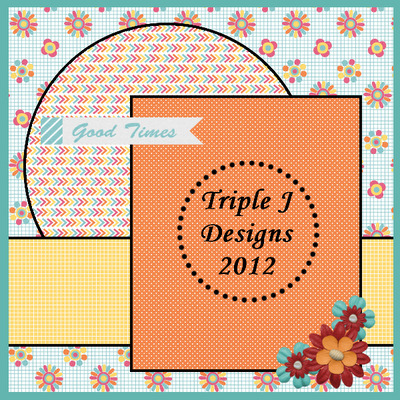 Another freebie from Sassy Studio Designs! 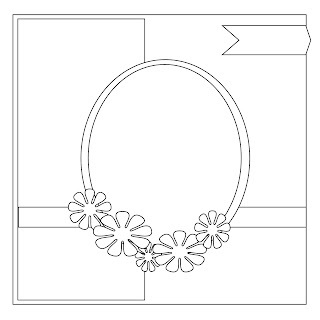 All you have to do is go to our Paper Craft Planet group and become a member! Every week there is a new image! And every two weeks a new challenge! Today's image is a sweetie called "Ballroom Babe". Our challenge (now in it's second week) is "What's Your Style?" My style almost always starts with a sketch! 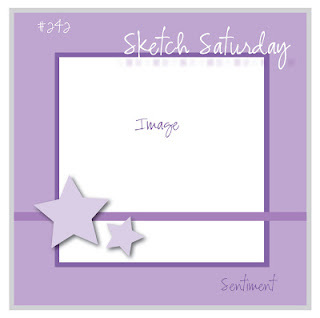 This one is from Sunday Sketch & Stamp. Then there are layers of designer paper, a Copic colored, fussy cut image and oodles of embellishments! 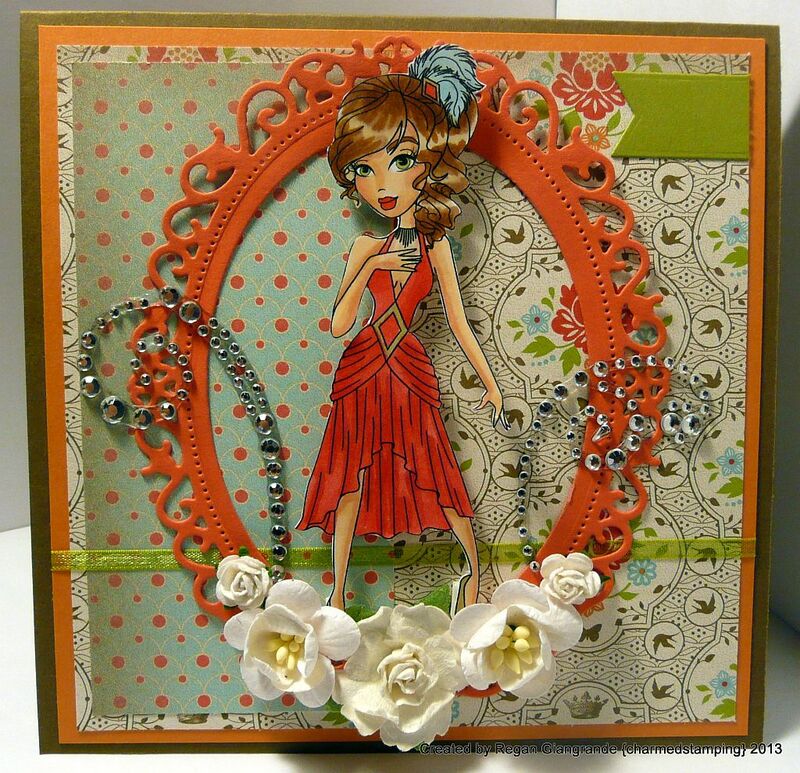 My favorites are die cuts, flowers, bling, and metal! I've used all of those here except for the metal. 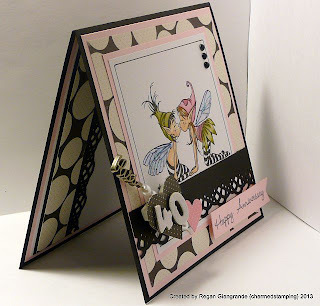 Papers are Stampin' Up - Everyday Enchantment. The dies are Floral Ovals Nestabilities from Spellbinders and fishtail banners Die-namics from My Favorite Things. 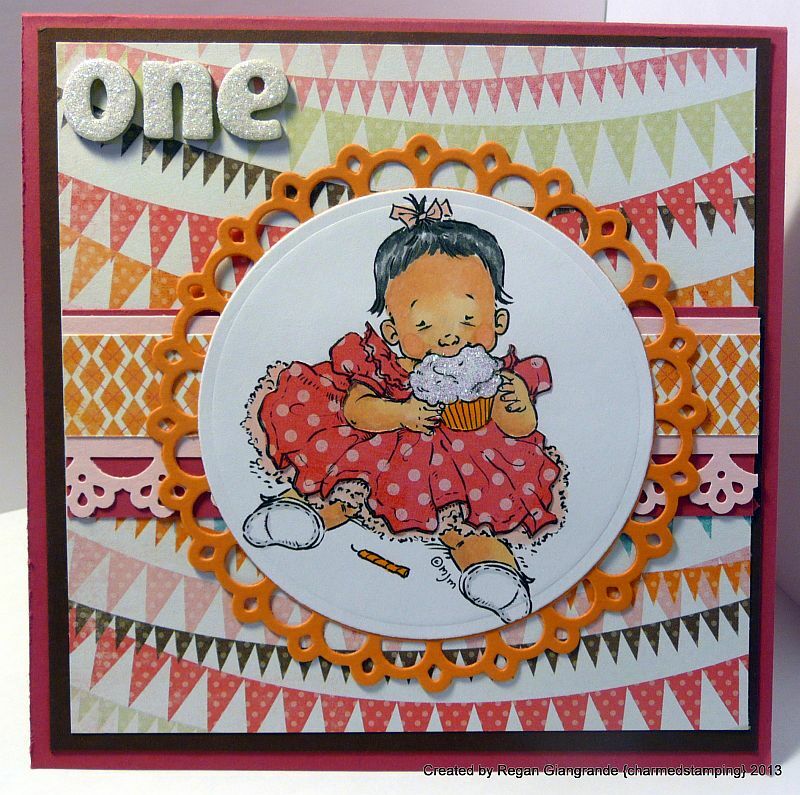 Ribbon is also from Stampin' Up and flowers are a mix of WOC and Recollections. Bling swirls are Recollections. I have been having issues getting started on my crafting projects lately, but once I do I like the results! There is so much to do in the day and I find myself longing for the couch rather than my desk when all the "Have-Tos" are done! I work a full day then come home to full-time job #2 - MOM! 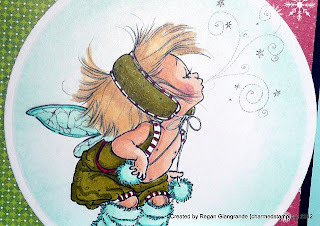 Perhaps it's just the super cold weather we've been having that has me in hibernation mode! I have plans for a game night with my brothers tonight, but I'll be back to crafting on Saturday so that I'm ready to show you my project for the first Sassy Studio Designs release of 2013! 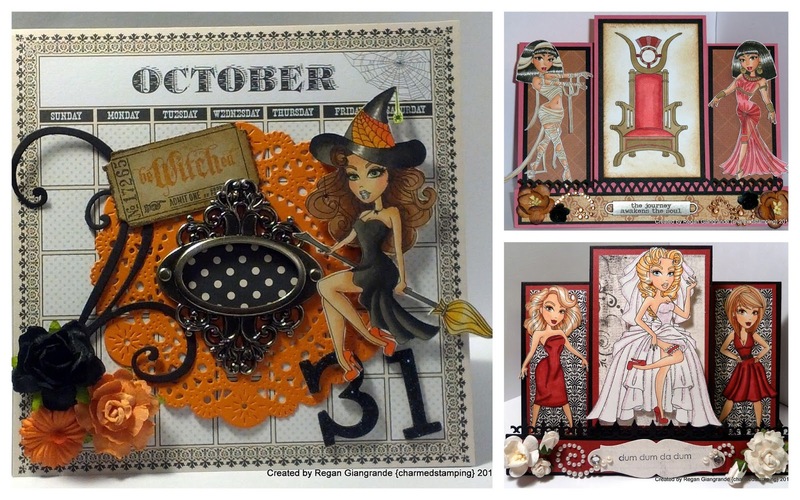 Join us tomorrow for a two day blog hop to celebrate! I hope everyone has something wonderful planned for their weekend! Thanks for stopping by and hope to see you for the release! Markers used: Copics (E11, E21, E00, R20, YG93, B00, E25, E31, E37, R24, R35, Y28). I decided to do both! My colors and polka dots are inspired by the photo (as is my image). And I've used a word stick pin that reads "Bliss" which I added a few pearls to. 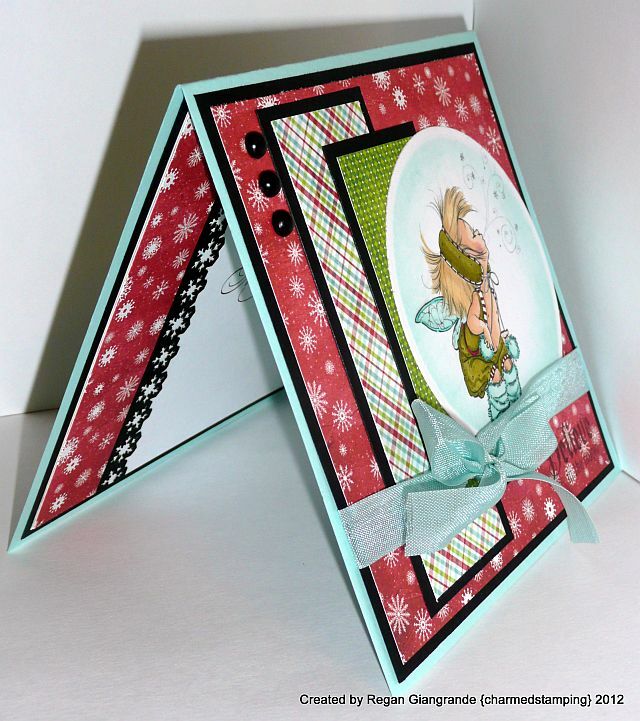 My creation features an Emerald Fairy image from our sponsor A & T Digital Designs. Anita generously offered several images for the design team to use for this challenge. This lovely couple is called Willy & Mia. My parents celebrated their 40th wedding anniversary yesterday so I made a card for them. (Coincidentally, I will be 40 this year in August! 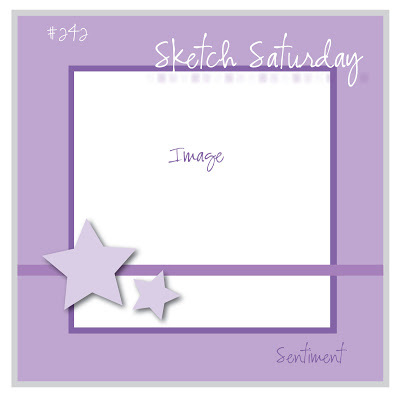 *wink, wink*) I started with sketch #242 from Sketch Saturday. Papers are Sabrina - Making Memories. 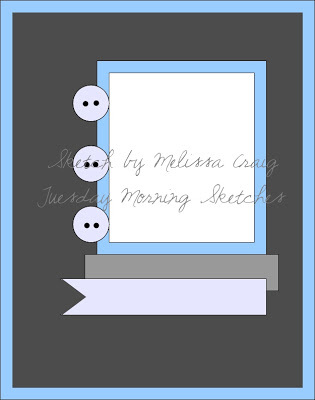 The image is colored with Copics and I framed it with a hand-drawn line border for a little extra interest. 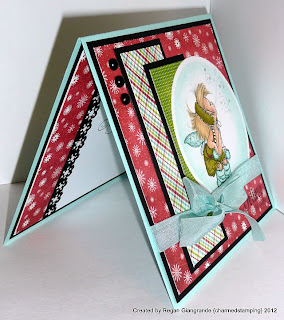 The border punch is Martha Stewart and the heart die is a Nestabilities from Spellbinders. I added glittered chipboard numbers to the larger of the two hearts, and stamped the sentiment on a fishtail banner die from My Favorite Things. Stickles on the wings is the finishing touch! Pop on over to The Corrosive Challenge to meet our new team members and view all the gorgeous pinspiration the entire team has to share with you! If you play along you have a chance to win 3 digis from the A & T Digital Designs shop for yourself! Thanks for stopping in today! We are off to NH for the day to visit a friend! This means no Pinterest for me.... Well, maybe a little! Markers used: Copics (E11, E21, E00, E31, E33, E37, R20, R81, R85, N6, N8, YG91, YG93, YG95, YG97). I tend to get songs stuck in my head when I craft and while working on this card I couldn't get Avril Lavigne out of it! This sassy skater girl is this week's free image for Sassy Studio Designs' Fabulous Freebie Friday on Paper Craft Planet! She is available for 24 hours, starting at 8am EST. And there is a brand new challenge starting today as well! This fortnight the theme is "What's Your Style?". We want you to show us what style or technique you love and excel at! Tell us a little bit about your style. My "style" usually starts with a sketch, but I like to embellish! Empty space on a card bothers me! 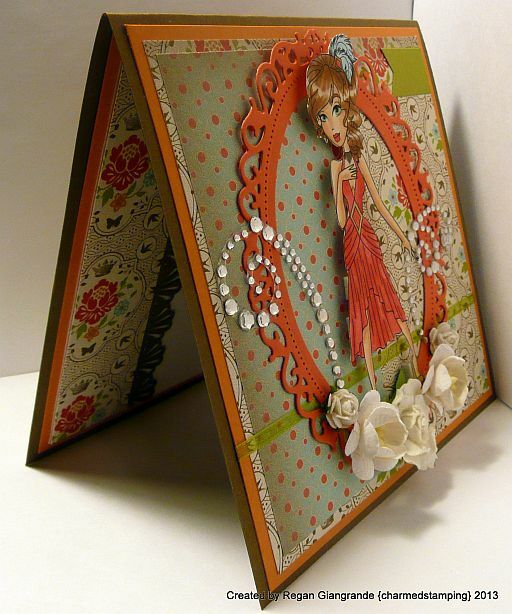 My favorites are bling, flowers, Tim Holtz metal, and chipboard stickers/flatbacks. 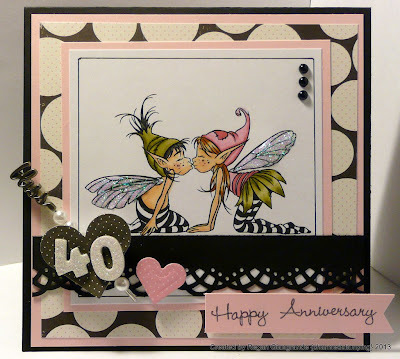 I added a couple of those on this card with my bling swirl and fun stickers. 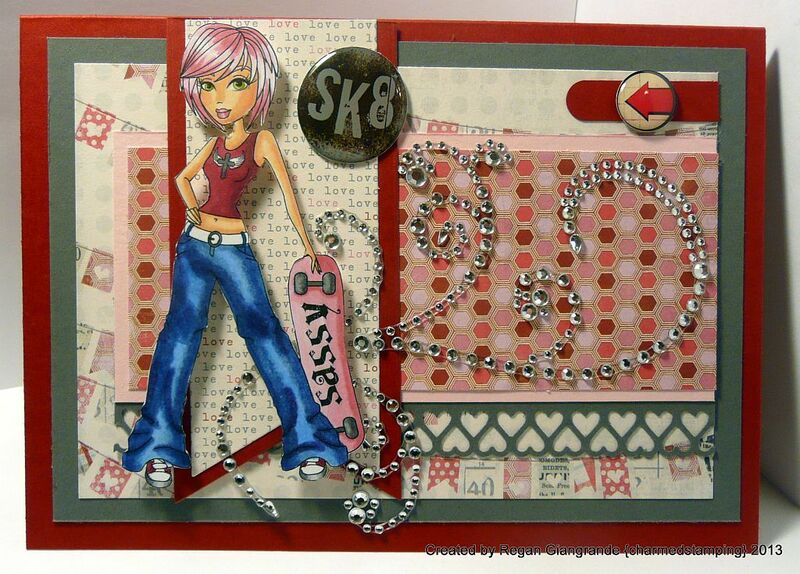 Skater Sassy is colored with Copics and fussy cut (another part of my style). I used a Martha Stewart border punch and the My Favorite Things Fish Tail Banners dies. Papers are My Mind's Eye - Love Me. 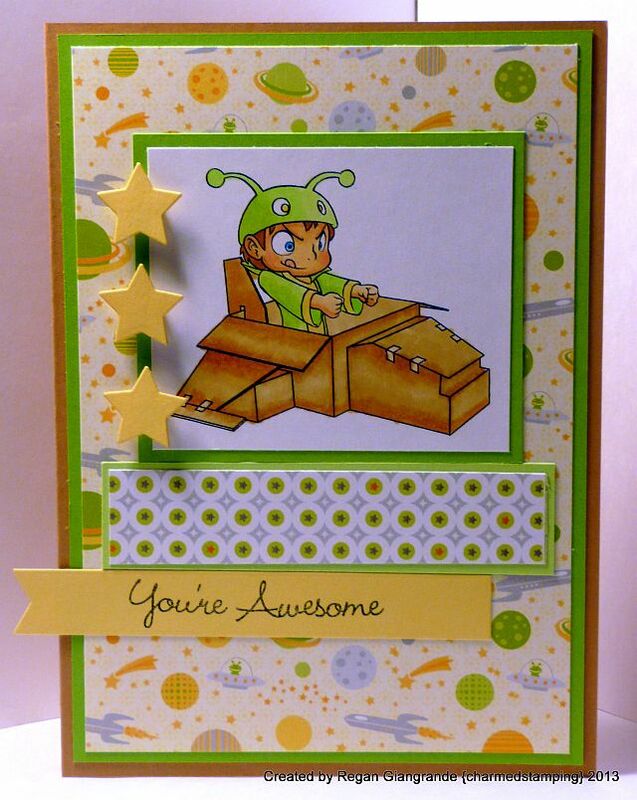 Head over to Paper Craft Planet before she's gone! And while you're there be sure to check out the rest of the Fabettes! What is each of their styles? Thanks for stopping by! I'll have a new Corrosive Challenge for you on Sunday! Plus there is an announcement coming on Monday as well! 2013 is shaping up to be an exciting year! 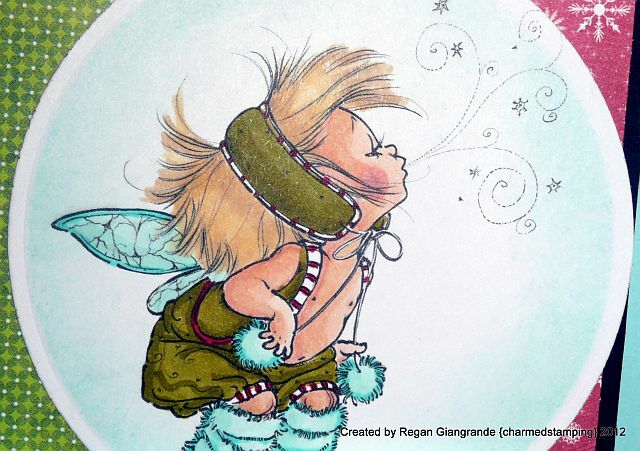 Have a fabulous weekend, my crafty friends! Markers used: Copics (E11, E21, E00, R20, R81, R85, YG93, YG95, N2, N4, N6, B32, B34, B37, B39) and Prismacolor Art Markers (150, 151). I know everyone else is watching football today but, despite living in Patriots territory, I really have no interest in the game. So I thought I'd take some time to catch up on a few card created within the last month that I never got around to blogging. First up is a Christmas card I created for my son's day care provider. 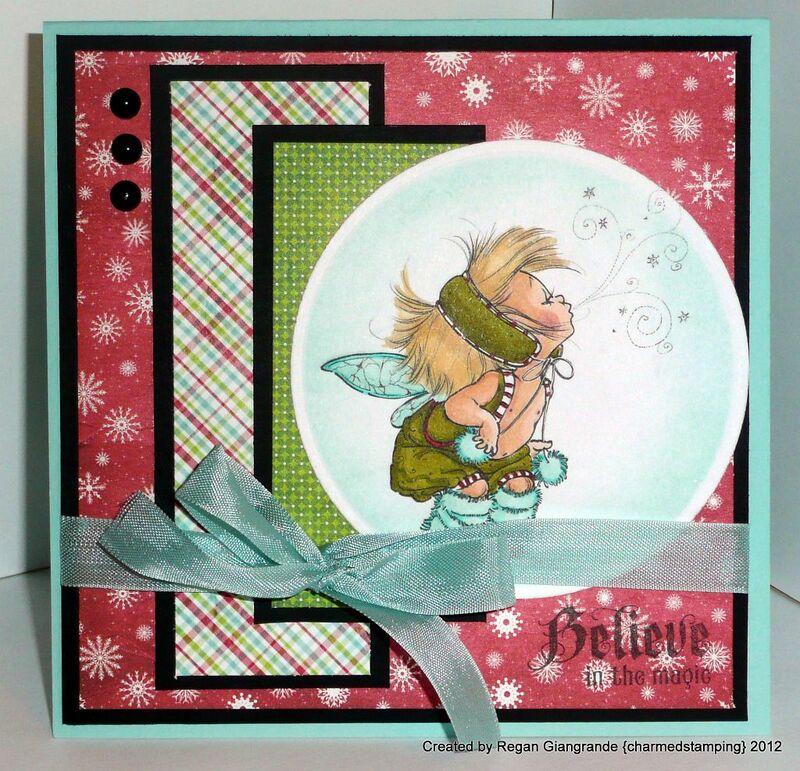 It features Winter Fairy Halla from Mo's Digital Pencil. The image is colored with Copics and cut with a Classic Circles Nestabilities from Spellbinders. Papers are My Mind's Eye - 'Tis the Season. 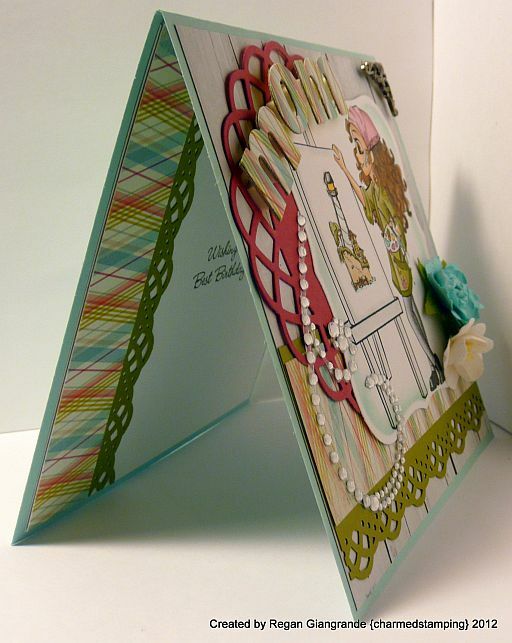 Seam binding and flat back pearls adorn the card. 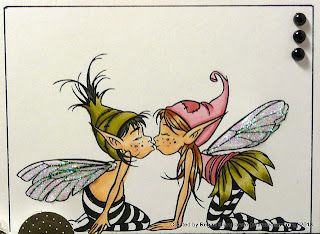 The sentiment is from a Waltzingmouse Stamps set called Twas the Night Before Christmas. 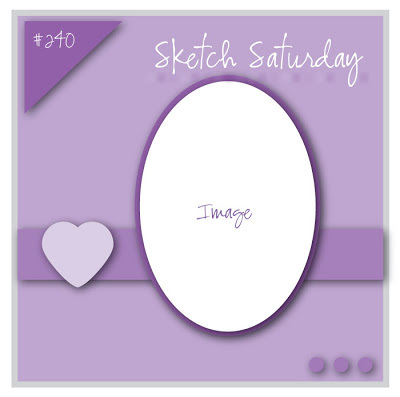 Sketch is courtesy of Seems A Little Sketchy. Markers used: Copics (E11, E21, E00, R20, Y32, E31, YG93, YG95, YG97, R29, BG10, BG13). Next is a birthday card for a co-worker. Blanche from Saturated Canary reminded me so much of my shoe-loving fashionista friend that I had to use her for this card! 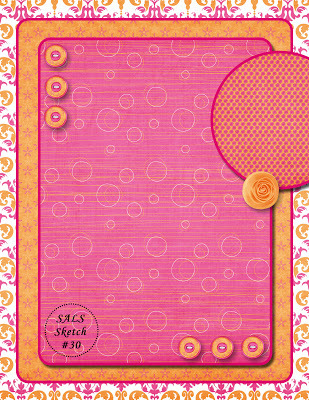 Blanche is colored with Copics and cut with a Classic Ovals Nestablities and matted with a Lacy Ovals Nestabilities, both from Spellbinders. 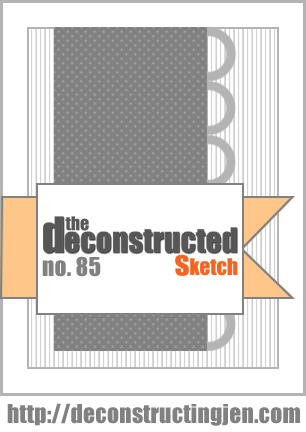 The sketch was created by my amazing design team mate Kathy for our DT call over at The Corrosive Challenge. Papers are My Mind's Eye - Vanity Fair. 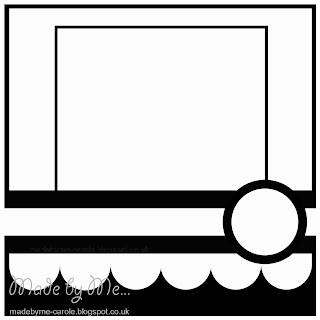 Punched border is Martha Stewart. The only embellishments this card needed were a few flowers. Markers used: Copics (E11, E21, E00, R20, E04, E13, E17, E19, E23, E37, YG91, YG93, YG95, YG97). Here is another birthday card, but this one was a request from a co-worker for her mom. 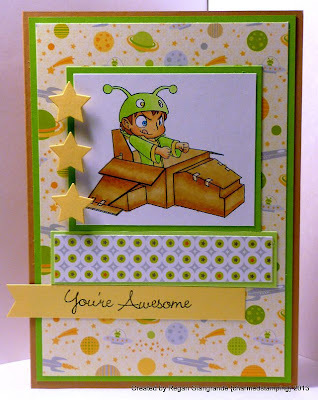 I've used Artist London from Simply B Stamps. She is from the Back to School Teen Scene collection. 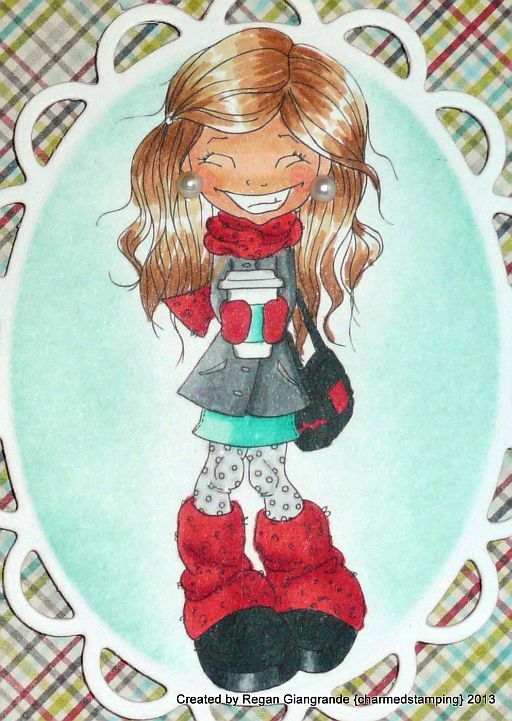 She is colored with Copics and cut with a Labels One Nestabilities from Spellbinders. 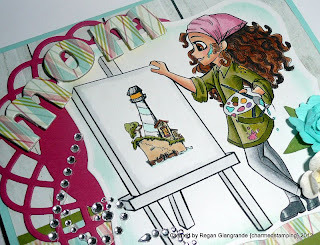 The image on her easel is one from Tiddly Inks called Light My Life. 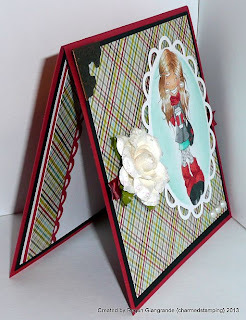 The border punch is Martha Stewart and I also used two dies from My Favorite Things, Dizzy Doily and alphabet. Papers are My Mind's Eye - Dolled Up. I added a bling swirl, flowers, and a metal corner. This is another layout from Seems A Little Sketchy. Markers used: Copics (E11, E21. E00, R20, YG91, YG93, YG95, YG97, N0, N2, N4, N6, N8, E79, E37, E31, E23, Y35, R81, R85, V17, BG10, BG13). Celebrating a first birthday is special and I wanted my cousin's daughter to have a card that was worthy of that. Kai Is One (Girl) from Mo's Digital Pencil fit the occasion. This little cutie is colored with Copics and cut with a Classic Circles Nestabilities from Spellbinders. She is then matted with a Picot Circles Nestabilities, also from Spellbinders. The papers are My Mind's Eye - Fine & Dandy Girl and I paper pieced her party dress using the polka dot pattern. The border punch is Martha Stewart. 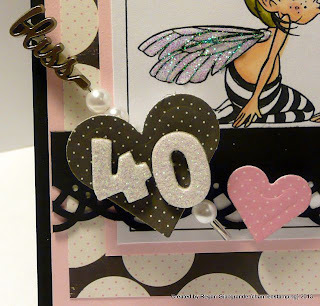 I added some glittered chipboard letters to spell out her age. Markers used: Copics (E11, E13, E21, N2, N4, N6, N8, R20, YR15). And finally, a birthday card for my son's day care provider. I see now I used the same papers as her holiday card! lol This is Latte from Saturated Canary and I thought she was perfect for a winter birthday. 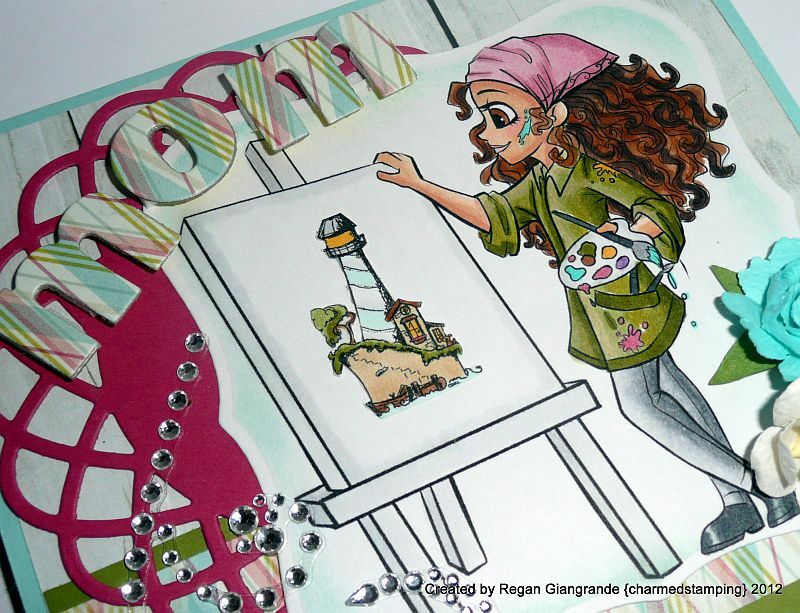 She is colored with Copics and cut with a Lacy Ovals Nestabilities from Spellbinders. I sponged some Pool Party ink around her. Paper is My Mind's Eye - 'Tis The Season. I also added pleated ribbon in Riding Hood Red, flat back pearls, a flower, and a Tim Holtz metal corner. Markers used: Copics (E11, E21, E00, R20, R24, R27, R29, BG10, BG13, BG15, N0, N2, N4, N6, N8, E23, E33, E31). Phew! Okay, that was quite a backlog of cards! Hope you enjoyed my creations. I am off to watch a movie with the small man. Yup, still no football here! I have a confession. I have spent more time on Pinterest this week than I have crafting. As a result I now have the urge to bake something dusted with powdered sugar and to rush out to buy storage cubes and pretty baskets to store my crafty stash in! I want one of those posh, organized, clean, white, sunny spaces! Instead, I sit here amid my dark wood trim, a very large pile of card stock scraps and the array of toddler toys strewn about the floor. Posh? Never! But maybe I can get organized. First, I need to do some clearing out. I started with my card stock last night. 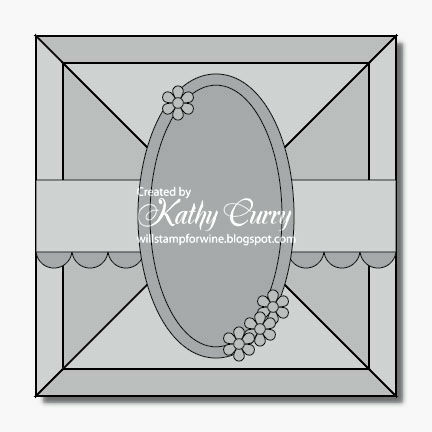 If you're like me and the new year has you cleaning house now is a good time to join Sassy Studio Designs over on Paper Craft Planet for this week's Fabulous Freebie Friday! 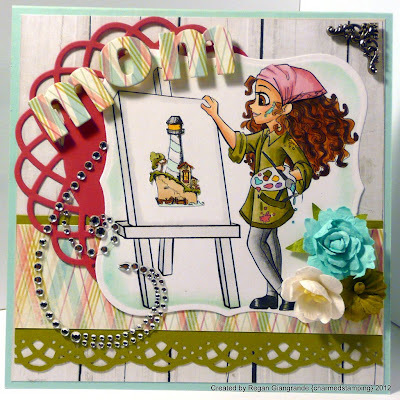 Not only is there an amazing new image called Cheerful Chelsea, but there is a challenge that will help you utilize some of those neglected supplies. Visit PCP for all the details and to download Chelsea for yourself! She is available for 24 hours only, beginning at 8am EST. The current challenge is "Out with the Old". 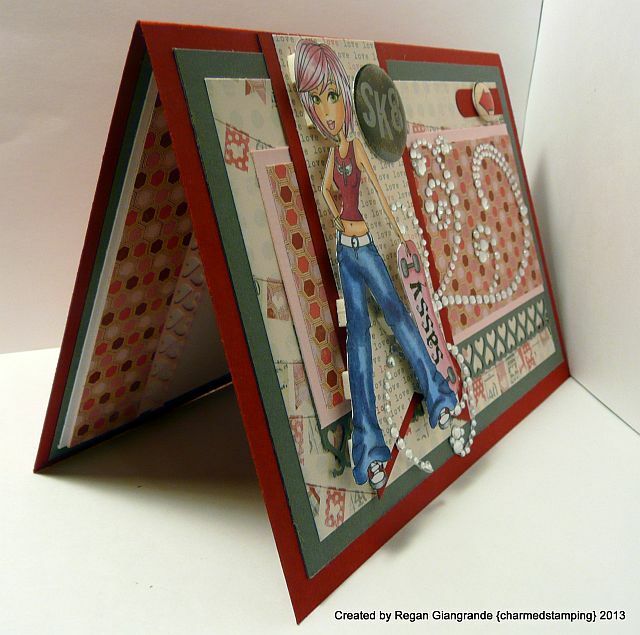 My stash items are the Valentine Circus designer paper, which is from K&Company, and the red adhesive gems. The flower is also from my stash. 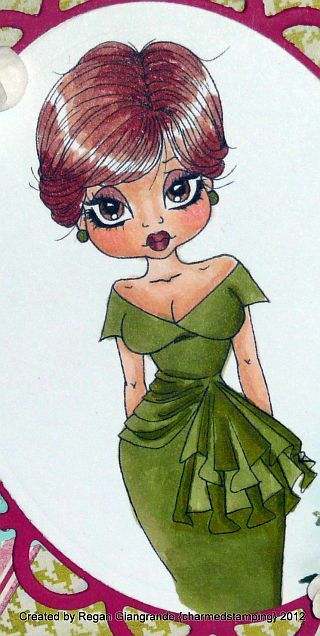 Chelsea is colored with Copics and fussy cut. 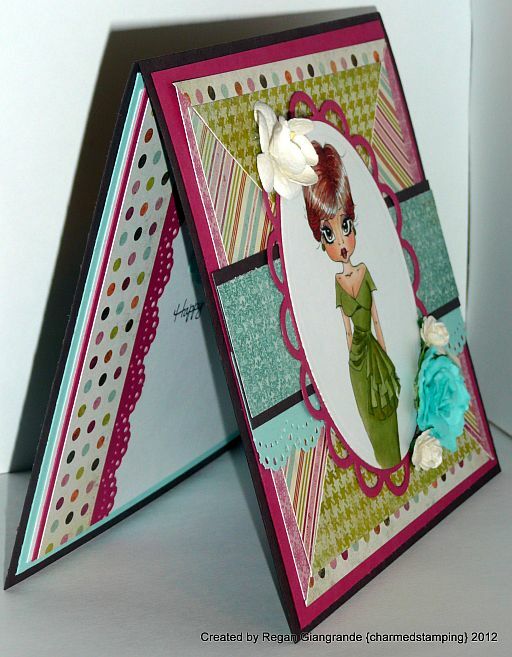 The Fabettes have some gorgeous creations this week so be sure to leave them a little love when you visit! Markers used: Copics (E11, E21, E00, R20, E39, E23, E31, B39, B37, B34, B32, YG93, E04, YR15) and Prismacolor Art Markers (150, 169). 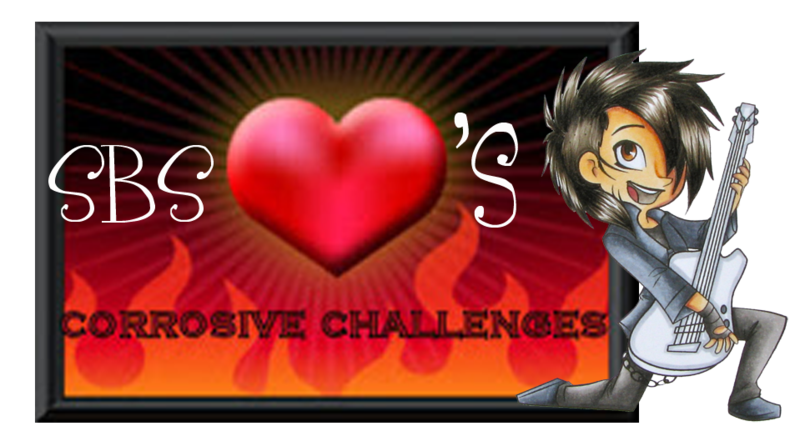 The Corrosive Challenge is back and ready for the new year with a new look, new challenges, and new team members! Check out the blog for all the exciting changes and join us on January 20th to meet our new team! 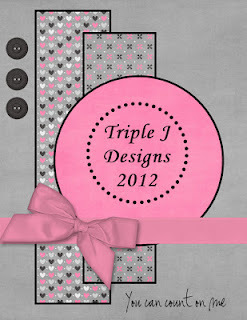 But today I'm going to tell you about our first challenge for 2013! Our fabulous sponsor is Simply Betty Stamps! Betty has not only generously provided images for the team to use, but she is offering a $15 gift voucher for her store as the prize for this fortnight's challenge! Check out the SBS shop HERE for the quirk in you! The theme for the challenge is "Out with the Old". Just use something from your stash on your project (and tell us what it is) to be eligible for this fantastic prize! I selected Pwew Pwew Pwew Jude from the Jude & the Rockers Space collection. Kayne asked me if I would make him a card and when your three year old puts in a request like that how can you not oblige him?!?! Jude is colored with Copics. 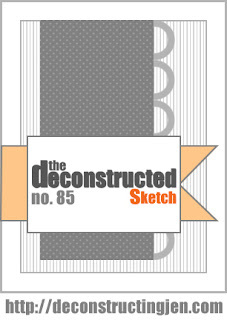 The sketch is #179 from Tuesday Morning Sketches. My stash item is the designer paper. It is from the All About Boys stack by DCWV, and I've had it well over a year now. 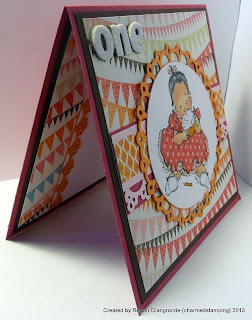 Since this card is for a toddler and he likes to handle them I kept the embellishments to a minimum, just adding some die cut stars (Spellbinders) and a My Favorite Things fishtail banner die cut stamped with a sentiment also from MFT. I hope you'll head over to The Corrosive Challenge blog to see what the rest of the crew has managed to clean out of their stash! Markers: Copics (E11, E21, E00, E23, E31, E33, E34, R20, YG03, YG06, YG11, Y32, B02, B04). Happy New Year! Welcome to 2013! I'm sorry I was so quiet over the holidays, but it was a hectic, fun, wonderful time and I wanted to treasure every magical second of it that I could with my small man! Now I'm back and ready to jump back in to my design team duties! I've spent this week getting caught up on all the admin stuff I had been neglecting so I still haven't done much crafting. My creative space is in need of a major cleaning and organizing overhaul... But that is a topic for another day! 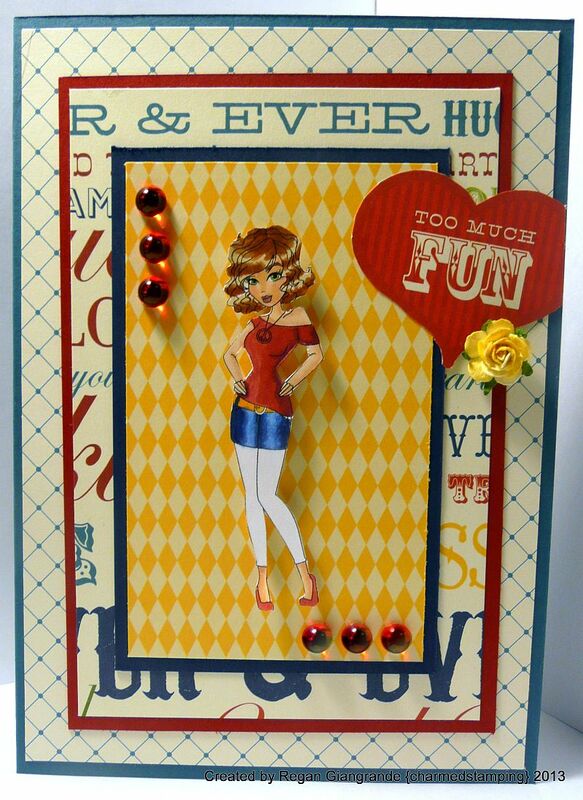 I did get a card made for this week's Sassy Studio Designs' Fabulous Freebie Friday, though! Today's image is called "Diva Dianna". 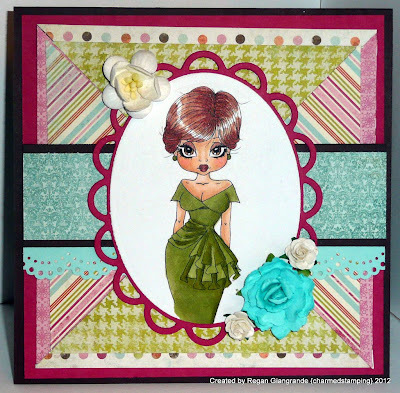 She is one of the retired fashionistas and you can snag her over at our Paper Craft Planet group for the next 24 hours! There is also a new challenge starting today- our first for the year! The theme is "Out with the Old". We want you to use something from your stash on your project. 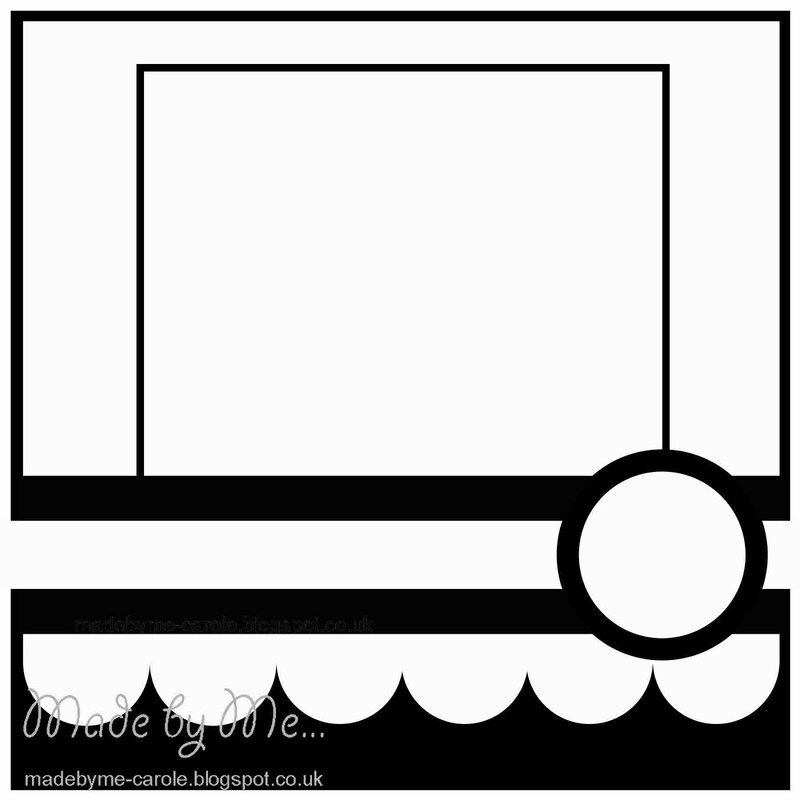 Pop over to PCP to download the image and to see what the rest of the Fabettes have created!